So last night I watched the movie ‘Moving From Emptiness’ a great introduction to Zen Painting by the adorable Alok Hsu Kwang-han. The messages were very meaningful and deep, and I wanted to CREATE as soon as it was over. I spent the winter painting Enso’s. The Japanese form of calligraphy painting of a circle. 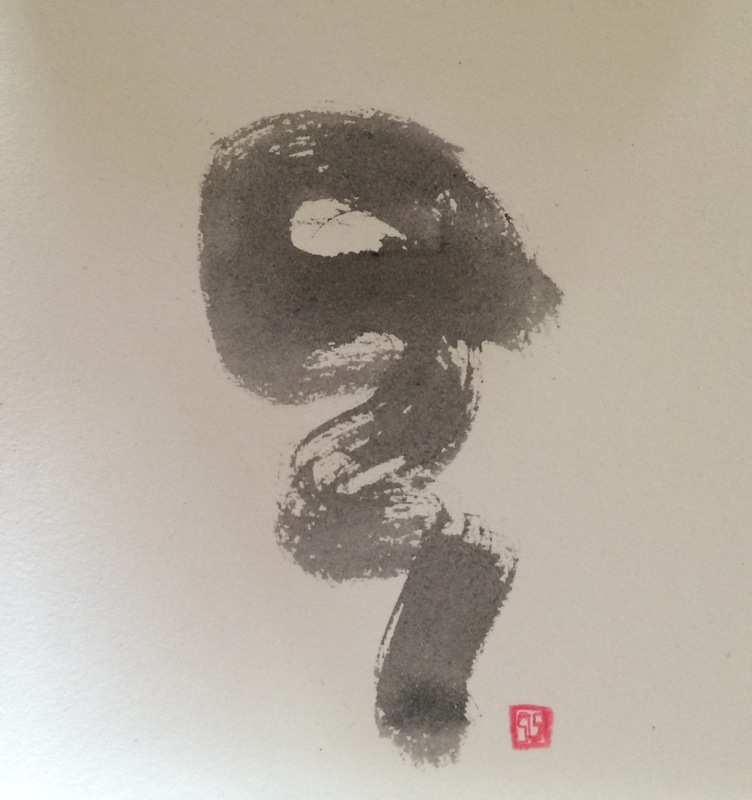 It’s form represents the void, the emptiness that the Tao teaches, and it’s also a representation of the artist’s state of spirit. 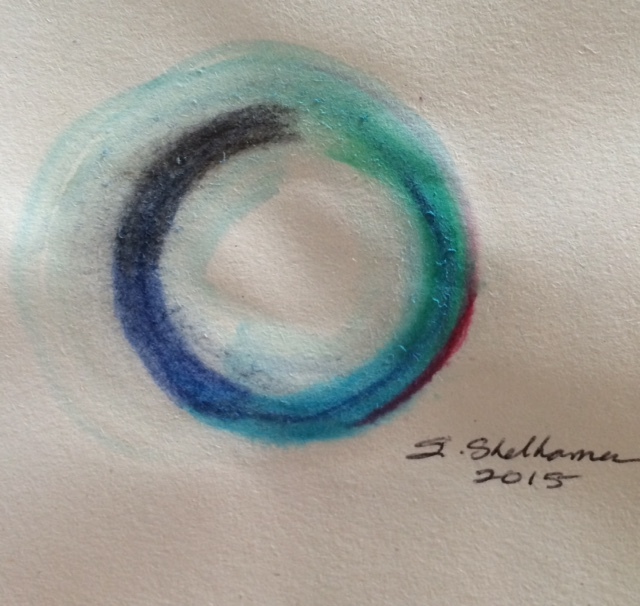 I first learned how to do Enso’s by watching a youtube video by Bill Buchman . Here is a sample of one of my Enso’s inspired by my Beta fish named ‘Enso’. After last nights ‘Moving into Emptiness’ I called a customer who I am painting her dog portrait and at a freezing point and explained I am stuck. I sent her pictures and she loves it. Then I looked at it with a more empty mind, and I can now see a direction I want to go. But as a warm up I decided to try the zen painting taught in the ‘Moving From Emptiness’, clearing my energy first, then receiving the creative energy into me. And then painting what inspired me at that moment. 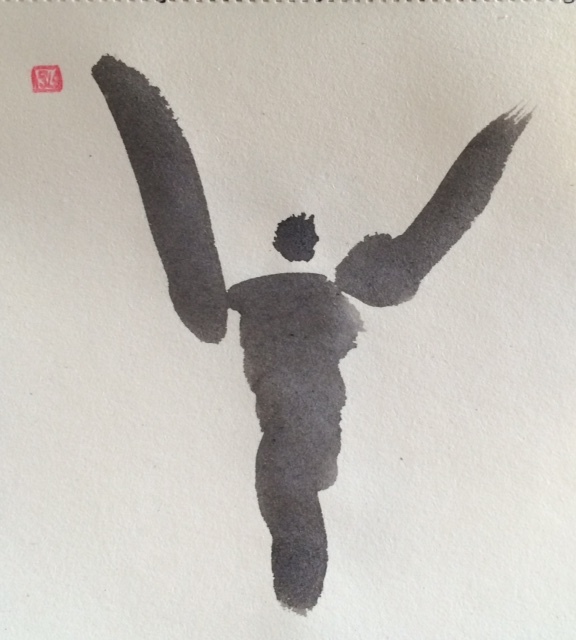 But first I lit an incense to set the mood and made my ink with a Chinese ink stick – a calming affect in itself. And painted a self portrait of receiving the creative energy, or opening up to emptiness is more like it. I added my own little hand drawn red stamp at a point of energy in the painting as Alok taught in the movie. Then I spun circles around and pretended to be a bumper car. It’s a technique I teach in Laughter Yoga, and was pleasantly surprised to see Alok do it with his class, and then give the meaning of the story behind it. Afterwards I cleared my head and wondered what I would paint. I looked around the room and noticed the smoke from my incense and painted it. And I loved the results. Again putting my hand drawn stamp at the point of energy in the painting. Just like with the Ensos I am hooked, and want to paint more and more of them. But I better get to work on the art that pays. I’ve put it off long enough, and now the juices are flowing.